Well, out with the old, in with the new. Recently sold our 2004 Corvette, purchased new on August 19, 2004, to a buyer in Texas. He is a forum member ( @bigsapper ) and the sale couldn’t have gone any better. Even long distance, there were no issues with the sale and it’s nice to see how easy a long-distance transaction can be when 2 folks conduct what could have been a transaction fraught with suspicion, paranoia and drama and just plain ‘do the right thing’, working towards a common goal. Props to Forum member @bigsapper for making this as easy and streamlined as possible. While the 2004 is out of our hands now, it is by no means on the downside as @bigsapper has some big plans for it and is already embarking on the second phase of this car’s life. His thread detailing the plans for this car is located here, a thread which we’ll be watching with great interest to see what comes next. Pondered a Grand Sport for a bit, the looks are certainly appealing but, in the end, merely added some things that I would not really have a use for. This car will be my wife’s daily driver from April thru November and she certainly has no need for dry-sump and some of the other ‘track-centric’ items included with the GS so this is where we landed; I think it will fit our needs quite well. And yes, ordered with the suspect A8 transmission despite the long-standing issues reported by many. I’ve had a variety of manual transmission cars, from Mustangs to WRX’s and frankly, I’m over that part of cars at this point. Will we be beset by A8 issues? Certainly a possibility, kinda playing the odds on this one but only time will tell how troublesome it becomes. If it becomes too problematic, then we just sell the car and take the hit on depreciation and move on to something else…there’s certainly bigger problems to have in life than your ‘toy’ car not living up to expectations. Would obviously be disappointing but not the end of the world either. Life goes on. 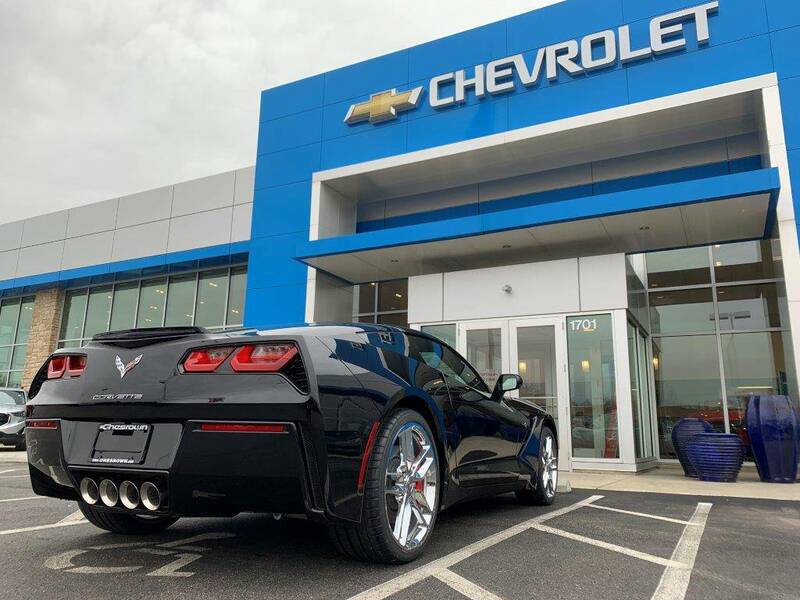 The car was ordered from Chesrown Chevrolet in Delaware, Ohio and the deal, conducted mostly via e-mail, couldn’t have gone better. 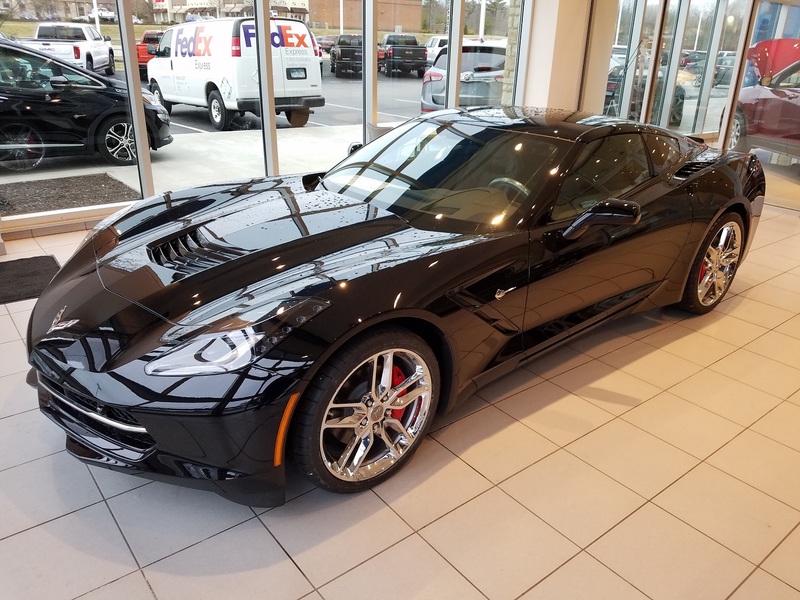 While I live in NE Ohio, I was looking for a dealer closer to central Ohio as the car will be going right from dealer to Esoteric Detailing in New Albany, OH immediately upon delivery for a full new car protection package. 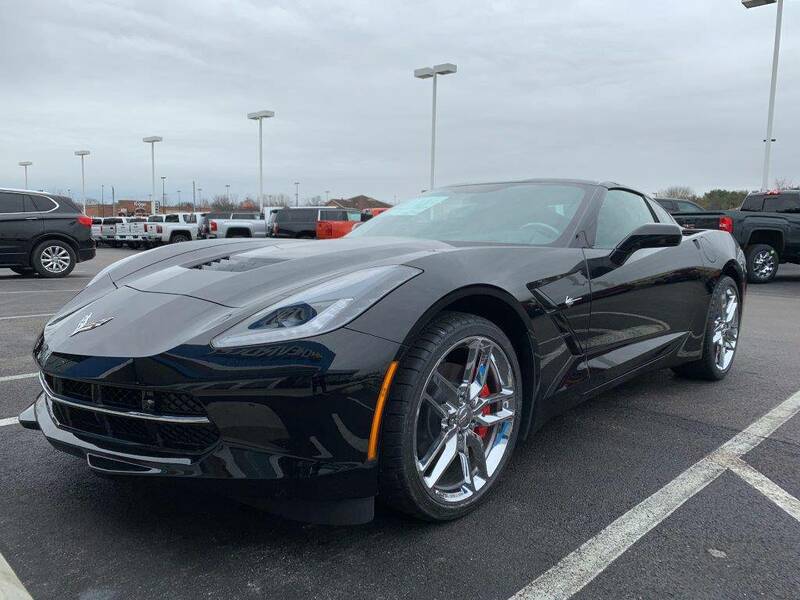 Yes, I could have done a Courtesy Delivery from one of the larger volume Corvette dealers and perhaps got a little better price but dunno, not really a fan of pitting dealers against themselves to save a few hundred $$. 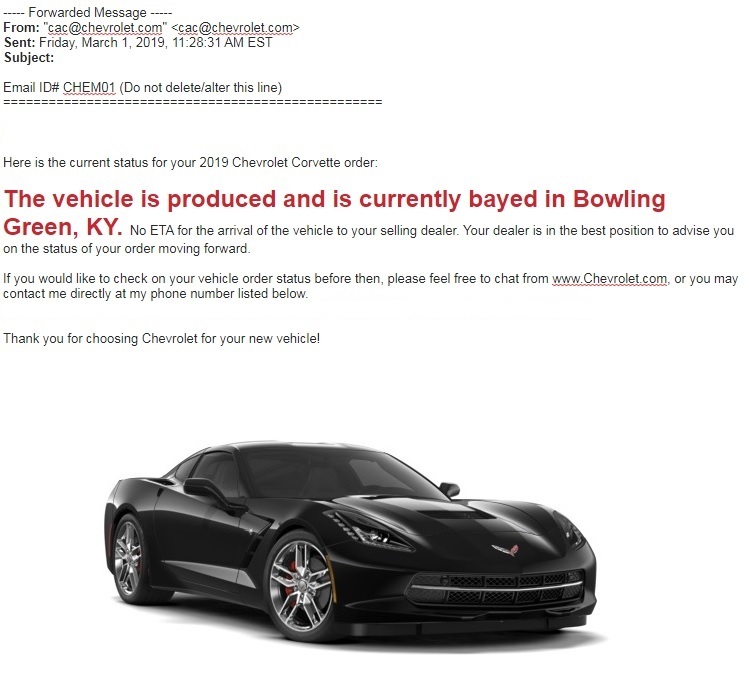 A note regarding the Corvette Museum and their program regarding GM Supplier Pricing for members; the program has ended (as of 12/31/2018) and indications are it may not be back anytime soon based upon nothing more than the impression I got after contacting the Museum. A moot point for the most part as many high-volume dealers can beat the supplier price anyway. In any event, I’m completely satisfied with the deal and look forward to working more with Joey and Chesrown as we move forward thru the process. I hear they may be getting to purchase another COPO Camaro…that’s my kinda dealer. With all the housekeeping items out of the way, we’ll move on to plans for this car going forward. While with the C5, adding a few bolt-on’s was fun but I really don’t see anything being done to this new car mechanically. Won’t be laying on the floor of the garage installing long tube headers, a cold air intake, painting brake calipers or sending it in for a dyno tune like we did with the C5; much like manual transmissions, those days are in the past for me. Instead, we’ll be investing some money into the aesthetic side of things with an eye towards keeping the car in as good of visual shape as possible, with the least amount of effort on my part. I like black cars, I like clean black cars but I don’t necessarily like cleaning black cars. So how did I decide where to send the car for the best protection I could justify financially when there are plenty of shops out there that do Paint Protection Film, coatings and such? 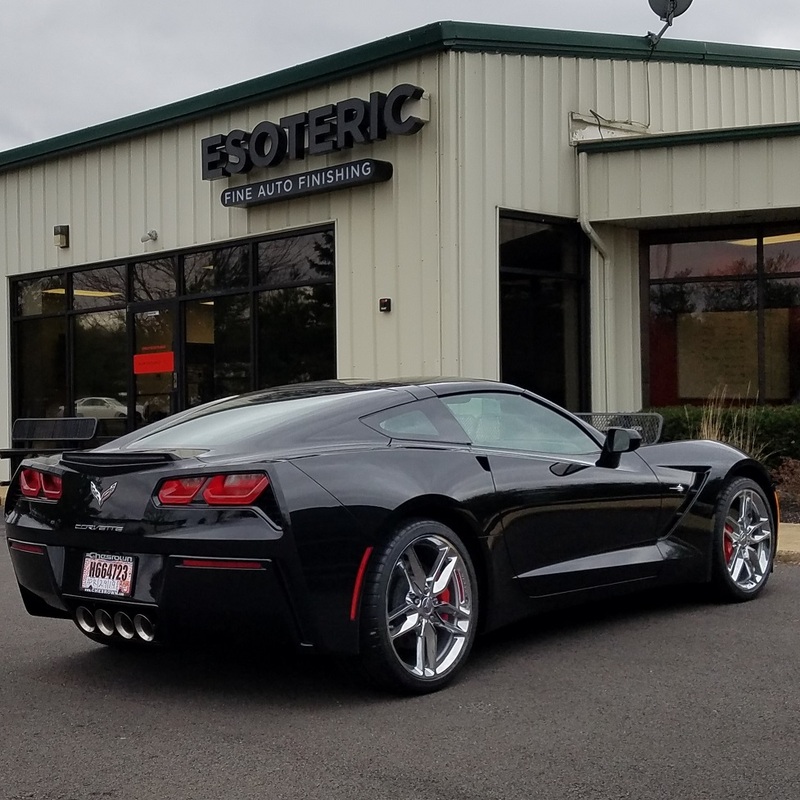 Well, being a DIY amateur hour detailer for the past 2 years (one with an addiction to correcting paint and applying glass/quartz/ceramic coatings), I ran into them (Esoteric) as they are the U.S. Distributor for one of my favorite coatings, Kamikaze. I’ve applied and watch a variety of coatings perform over the past 2 years, currently at around 20+ different products/many different combos…some mainstream, some kinda out there on the fringes....but as a result of it all I've become pretty familiar with both the pluses and minuses of quartz/glass/ceramic coatings. 1. Great Self Cleaning Abilities: Our cars see rain and often get rained on in the morning and then sit outside in the sun in the afternoon; don’t like waterspots. I like clean cars but don’t like cleaning cars. 2. Durability and resistance to environmental contamination like water spots and bird bombs: Don’t wanna have to worry about running home and immediately dealing with removing things that would otherwise etch bare paint. Like hard water spots did to our Corvette during the Zaino years. Also has to last cuz I don’t wanna be hauling out compounds and polishes every Spring, given reasonable maintenance. 3. Appearance: Well, stuff has to look good. Has to accentuate body lines, curves and hard edges. It needs to make me stop and admire it when walking towards it, walking away from it or catching a glance in the garage when I take out the garbage. While coatings are nice, despite the sometimes over-stated claims of scratch resistance, they have proven (for me) to be an excellent way to keep a car looking nicer with less effort on my part. They do also provide increased protection from environmental issues. Not the perfect solution (nothing really is) but the closest I would get in a DIY atmosphere. As mentioned, coatings fit some situations quite nicely but despite claims of “10h Diamond-Infused Hardness", they offer little to no protection from rock chips on the highway, of which the nose of the 2004 had evidence of over the 14 years. Additionally, once I had finally completed re-doing the C5 in Kamikaze in the Summer of 2017, a week later a rock bounced off the hood, leaving a nice chip that went through the black paint, and left the white core of the hood visible…major depression. So, since we’re starting new with the C7 figr’d may as well give paint protection film a go…definitely not something I could do myself in the garage and a step beyond coatings. Coatings *may* offer some protection from light marring/wash induced swirling, have had varying experiences in that regard, but hopefully the limited self-healing properties of PPF will go a little further to alleviate very light things; need all the help ya can get with a black car. Over the past 2 years, since becoming familiar with Esoteric, I found them to be extremely helpful to me in my DIY endeavors; never failing to answer any silly questions I had despite the fact that they surely had more lucrative ways to spend their time. As time went on, started going to some of their events, during which I not only got to see some really entertaining cars they had worked on (including a $3M Bugatti Chiron) but was also able to look very closely at some cars that had rec’d some of the services I was interested in. Not sure if it is a forum member or not but last October I looked over the following car, very, very closely, trying to find any seams in the PPF or indications that the car had PPF applied. After about 45 minutes, I had yet to find any evidence of stuff like that. Additionally the STEK DynoShield they apply is both highly hydrophobic and has some self healing qualities so lightly induced marring from routine washing will likely not be a lasting issue. After seeing some of their work in person, watching some vids of other work they do and just spending some time getting to know them, I decided I wanted to pursue this PPF along with some aspects of their new car prep service when our new C7 arrives. I figure if they’re taking care of cars like those seen in the vids on the Esoteric Youtube channel, my little ‘ol Chevy will be in good hands. Will be a larger investment than applying a coating but I think going through the process is going to be great fun and in the end will result in the best protection I can get with as little maintenance going forward. Kinda like a baseball fantasy camp for automotive/detailing geeks like me. So, that’s what I got ahead of me in 6-8 weeks. I have no affiliation or vested interest in either the purchasing Chevrolet dealer, nor Esoteric Detailing. Just laying out what/why/where I’m getting things done, the thought process behind it, why I chose who I chose. Last edited by budgetplan1; 01-29-2019 at 05:33 AM. Henry427 and Mack like this. Budgetplan, welcome to the forum. Sounds like you are doing everything right with her. I HIGHLY recommend at least a clear bra on the front. Took a little longer for me to get mine, but couldn't be happier with the protection it offers. No rock chips since installed. My wife just got back visiting her brother in FLA and saw her first ZR1 up close. I won't post the pic she sent, but the person that owned it already had scratches and rock chips on the front end. If I'm spending $140k for a ZR1, I'll spend the $500 for the clear bra. Oh wait. I have the Z51 and did it. I also have the automatic in the year that has had the most reported problems and can happily say that she is running fine with no issues. I'm in the sport setting 99% of the time. Good luck with your new C7. Enjoy it. Post some pics when you get a chance. Thanks. Looking at 100% Clear Bra/PPF coverage....in for a penny, in for a pound. Nice to hear a positive experience with A8. '15 Laguna Blue 2LT A8, ECS Novi 1500 SuperCharger, TSP Headers, Alky Control, RPI Stage II Side Skirts, Z06 OEM Splitter, Laguna Blue Brake Calipers. I really tried to step outside our 'norm' in that respect but alas, I have failed to escape my history. Despite the fact that there have been several SRF members reporting problems with the A8, I would guess that more than 98% of A8 owners have not experienced any difficulties. Mine was at the dealership one time because of "clunky" down shifts. A simple reprogramming as described in a TSB fixed the problem. Welcome to the Forum and congratulations your new purchase. Based on your longgggg (joking) but beautifully written missive, your new car obviously will be well taken of and it will mutually take care of you and the wife providing tons of JOY every time you look at, start up and drive! By the way, you must be an English Teacher or just taught very well based on your writing style and perhaps an obvious love for writing to take the time to author that short book you just shared (again, lighthearted joking). I really do have an appreciation and love reading anything well written as you did, it was longgggg however, it was an easy read which is the art of good writing! Writing is said to be fundamental but it is something that we take for granted and I would also say that it is a special gift when done properly and you obviously are blessed with that gift. Again, welcome and be sure to post some before and after pictures once you get everything done! PS: I am not one of those with the special gift of writing so no critique needed from "anyone".....Kidding! Last edited by kgrant; 01-26-2019 at 07:18 AM. jsvette and Ateupjoe like this. Thank you for the kind words; the little voices in my head musta missed the concept of "less is more". Actually spent most of my adult life in Technology sector, software development for large corporation, "Office Space" type deal. When that was offshored after 25 years (Thomson-Reuters), decided to switch focus and talked my way into Swimming Pool Service company where I'm still at. Got somewhat fascinated with pool chemistry and mechanicals when we had pool built in '98, figrd it would be more fun than sitting in a cubicle banging on a keyboard all day...and I was right. Great fun where I'm at now, not nearly as lucrative but happiness > money for me. Added bonus is that we have a fleet of Service Vans, 3 or 4 of which get replaced with new ones each year. Since developing an addiction to paint correction and ceramic coatings 2.5 years ago I get to prep and coat the new ones each winter and watch the coatings perform over the long term. Between the Fleet vehicles and co-worker's cars I do for free just to try new things, when I get to work each day I can see how a majority of the 20+ coatings I've used work in real-world situations over the long term, with a variety of maintenance routines. If one is interested in such things, it's a really unique and entertaining situation. Vigilance247, jsvette and Ateupjoe like this. SgtMajUSMC(Retired) and Ateupjoe like this. 03/13/2019: Car has arrived at dealer, awaiting pickup. Ordered 01/22/2019. benplace, twowinns, Fireeagle and 2 others like this. Very exciting time and very sharp looking Stingray! Black with chrome wheels is a sharp and classic combo. budgetplan1, Fireeagle and twowinns like this. Congrats. Hope to see you cruising around Youngstown. Our club show is June 30. Well, took a shot and went with a dealer not based solely on price alone but rather a combination of things that I thought would provide the most satisfactory and entertaining overall experience. Unfortunately, oftentimes these 'great' ideas of mine end up on my list of things that "Seemed like a good idea at the time..." due to reality being at odds with my somewhat optimistic theoretical thoughts of how things 'should' work. Sometimes the 'glass half-full' ends up being 'half-empty' after all. 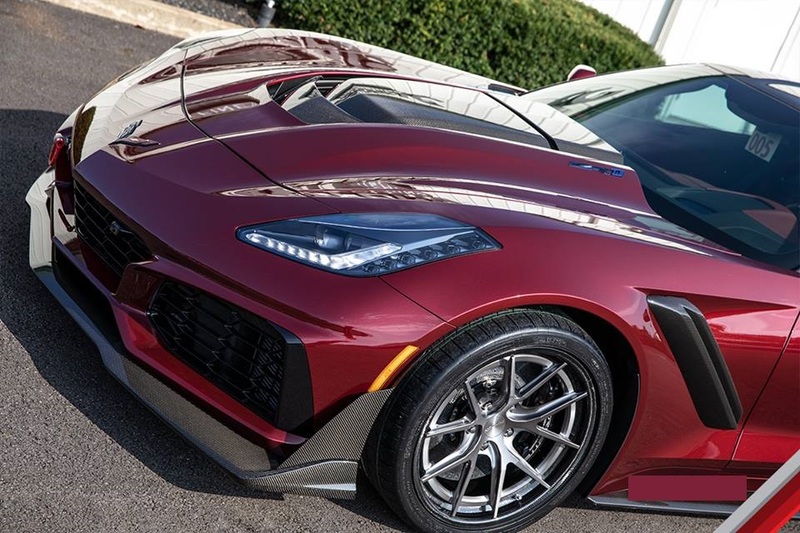 With that in mind, last Friday we hauled ourselves outta bed at 6am and drove 150 miles to be at the Chevrolet dealers door at 9am to finalize the paperwork and take delivery of Margaret's (wife’s) new 2019 Corvette. After that we drove it over to the detailer where we left it to have the windows tinted, STEK DynoShield applied to the entire car and the wheels pulled, prepped and coated with Kamikaze Stance Rim Coating. At the Chevy dealer we met the entire dealership family, got an in-depth tour of the facility, the obligatory introduction to the cars features but mostly just had a great time talking with everyone about everything from how their dealership runs, the auto industry in general, cars in general and any other obscure but interesting-to-me things that mighta popped into my head. While they were prepared for our arrival and we coulda probably finalized everything and been on our way in 30 minutes, we ended up spending about 2.5hrs there because time gets away from ya when you're having so much fun. Oh yeah, and we signed some papers and wrote a check too...almost forgot about that part. We musta seemed like an interesting couple as Margaret was nicely dressed, appropriately accessorized with bits of St Patrick's Day green and me, well I was wearing torn jeans and a Mr. Bubble t-shirt. Opposites attract, I guess. Got a chance to drive the car for about 30 miles on the way to the detailer and I think it’s gonna be a winner for us. The controllable dual-mode exhaust is a hoot, it's pretty comfortable for both Margaret and I and it's just overall a nice step up from our 2004 Corvette for us; priorities change as we age and I think we're leaning more to 'Tour' as opposed to strictly 'Sport' these days. Rides nicer in Tour mode, steering is lighter when set to that mode and, for me anyway, the view through the windshield while driving is somewhat less 'faith based' than it was with our previous model; I was just never quite sure exactly where the corners of that car were w respect immovable objects. I don't see myself laying on the garage floor bolting on longtube headers, cold air intakes or scheduling dyno-tunes with this one like I did with the 2004. We ordered the new one with specific options that we kinda DIY'd with the last one after having it for a while so the 2019 will likely stay pretty much stock. We were somewhat unsure of the visibility with the tint we were having done so when we got to the detailer, they grabbed some keys and had us sit in some cars with different levels of tint, both on the windshield and the other windows. In the end, we decided on 55% all the way around and actually seeing it on a car from the driver’s seat was a big help. The founder/owner was on site after doing some very early morning TV spots for the Columbus Auto show and getting the chance to talk with him and all the others there is absolutely an opportunity not to be missed if you're at all interested in the 'automotive arts'. The knowledge these folks have and are willing to share is just incredible. 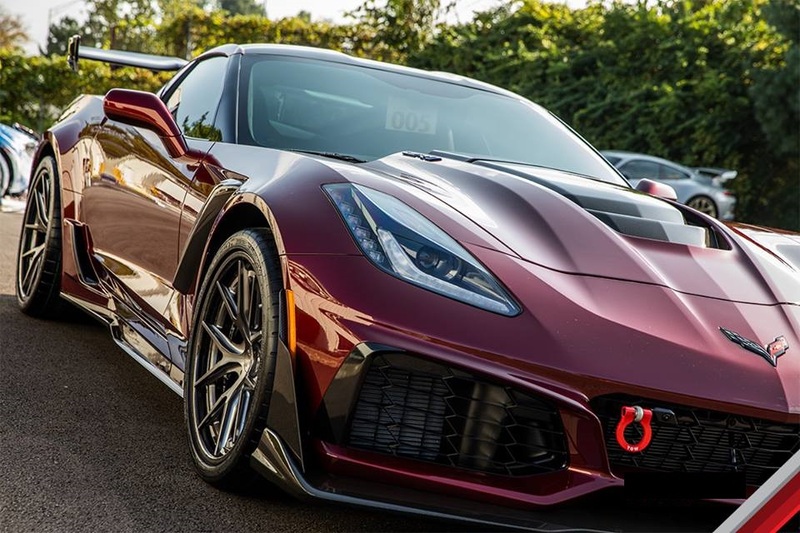 Coatings, PPF, exotic cars, cars in general, detailing specifics, trends in the industry (past, present and future) were all things we touched on. Sorry for taking up so much of your time, guys...you're just too darn nice for me to not babble on endlessly, absorbing as much info as I can. Finally heeded Margaret's mentions of "Kurt, you need to let these guys back to work..." and headed out the door...only to realize when pulling out of the parking lot that we forgot to leave them the keys to the Corvette. Oops. Thanks to everyone at Chevy dealer, most notably our salesman who's been putting up with me since last October, and the always first-class folks at detailer. It was a truly fun and memorable day...not sure actually owning and driving the new car will be as fun as the day we bought it. ALCHMST, SgtMajUSMC(Retired), Ateupjoe and 1 others like this.